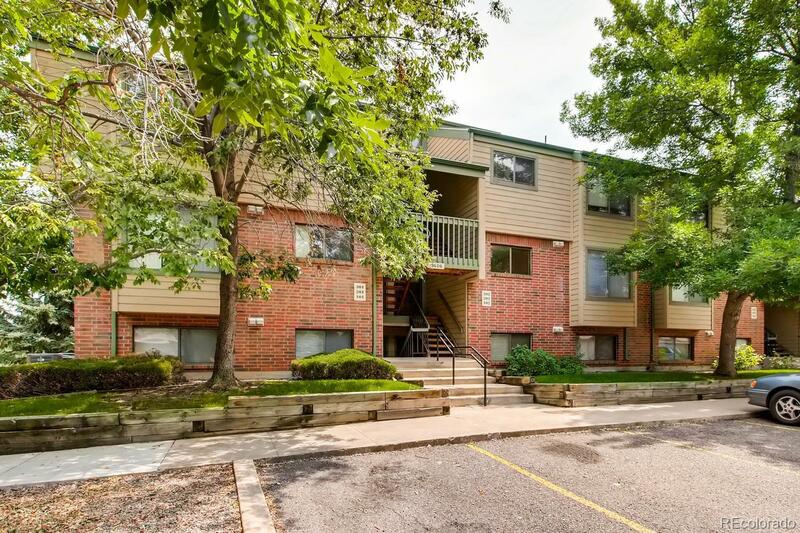 Move-in-ready condo with brand new carpet, ceiling fans and paint. A great second floor location overlooking tennis court and green space. Open floor plan ideal for gatherings with dining area flowing into spacious living room with a stone surround wood burning fireplace, ceiling fan and access to deck. Spacious covered deck offers an ideal outdoor retreat for grilling, relaxing or entertaining, includes a storage closet. 2 spacious bedrooms; one with walk-in closet and other has ample closet space. Full bath with tile floor. 2 parking spaces; 1 car detached garage and 1 reserved parking space in front of building. The Tall Pines Community offers nice common areas; green spaces, walking paths, tennis court, pool and clubhouse. Just minutes to Bear Creek Park & Trail, YMCA, convenient to shopping, restaurants, and entertainment. Easy access to Highway 285, just minutes to the mountains. The complex is currently not FHA approved.